The original name of the boat was “MOLITA”, designed by Charles Livinstone, who was a member of the English Committee of America’s Cup, for his own use and was launched in 1898. In 1920 a motor was installed and in 1936 the rigging was changed, so it turned to a Ketch Marconi. That’s how the current owner, Tim Liesenhoff found it in Oban (Scotland) in 2003. 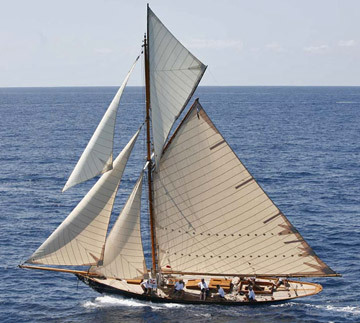 In 2006 the boat was launched again after its restoration following the original plans of its designer and with a new name: “Marigan”, which is a mix of the owner’s sons names Morgan, Marine, Oceanne and Logan. The same year, it participates in its first race after some sail testing..